C4 news yesterday 02/10/06 showed inside the US congress complete with fasces (the fascist symbol which hardly anyone knows about). Have No Fear! Peace, Love & Hemp is here! 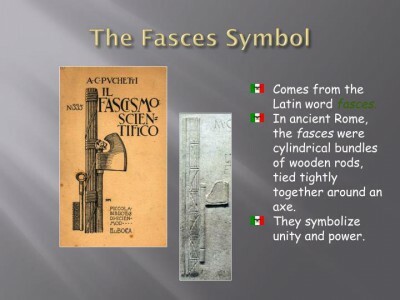 Do you know what a Fasci is? A Fasci is the symbol from which we get the word, fascism. It was a symbol used widely in the Roman Empire and it consists of rods bound together around an axe. This axe is the origin of the term Axis Powers for the fascist countries in the Second World War. The symbolism is of people and countries bound together under a common centralised dictatorship, the axe. Not only was this used by Ancient Rome back in the day as one of its Symbols of “Supreme Authority”, but also by the Original “Axis Powers” of Europe back in the first half of the 20th Century prior too and during WWII. Numerous governments and other authorities have used the image of the fasces as a symbol of power since the end of the Roman Empire. It has also been used to hearken back to the Roman republic, particularly by those who see themselves as modern-day successors to the old republic. From Ancient Rome to WW2 and Modern America It gets worse! Here is what is called a “Mercury” dime, from the 1940’s, Anyone “notice” anything?. Whenever you see a Fasci with a Laurel Wreath wrapped around it, (as above) it signifies that the Government using it, was Freely given absolute reign by the “People”!, and that the people recognize and submit to its Supreme Authority over everyone and everything!. Here is the Symbol for the Knights of Columbus. Whom are directly connected to not just Freemasonry, but Rome through its Jesuit Order. Even some National Monuments have Fasci in them! 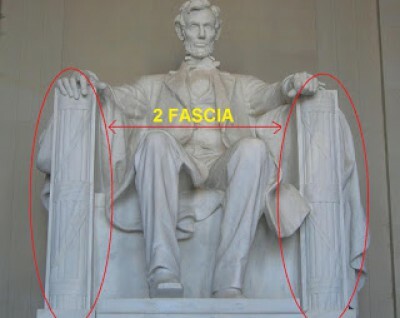 Note the Fasci making up the columns under Lincolns hands, Fasci need not always have the Axe head in it. And in the Congress Building. 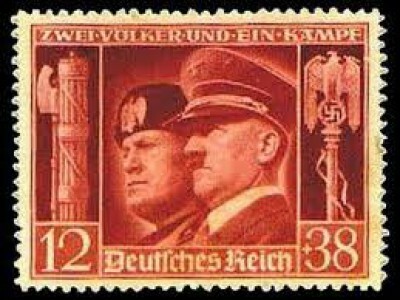 (In this picture, you can see two of these symbols of fascism on either side of the two center columns. Once we begin to understand the subliminal language of symbolism, the world we live in becomes much, much different than we formerly viewed it. The National Guard uses the fasces on the seal of the National Guard Bureau, and it appears in the insignia of Regular Army officers assigned to National Guard liaison and in the insignia and unit symbols of National Guard units themselves. For instance, the regimental crest of the U.S. 71st Infantry Regiment of the New York National Guard consisted of a gold fasces set on a blue background. The seal of the Senate. Note the crossed fasces at the bottom. The Seal of the United States Senate is used to authenticate certain official documents of the United States Senate, and its design also sometimes serves as a sign and symbol of the Senate, appearing on its official flag among other places. The current version dates from 1886, and is the third seal design used by the Senate since its inception in 1789. The use of the seal is restricted by federal law and other regulations, and so is used sparingly, to the point that there are alternate, non-official seal designs more commonly seen in public. The seal has a shield with thirteen stars on top and thirteen vertical stripes on the bottom, with a scroll inscribed with “E Pluribus Unum” floating across the top. Olive and oak branches symbolizing peace and strength grace the sides of the shield, and a red liberty cap (above the shield) and crossed fasces (below) represent freedom and authority. Blue beams of light emanate from the shield. Surrounding the seal is the legend “United States Senate”. Several of the elements are derived from the Great Seal of the United States. 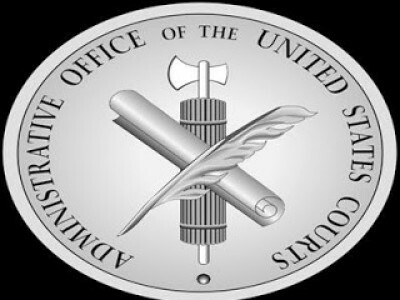 The seal of the US Courts Administrative Office. The Great Seal of the State of Colorado is an adaptation of the Territorial Seal which was adopted by the First Territorial Assembly on November 6, 1861. The only changes made in the Territorial Seal design being the substitution of the words, “State of Colorado” and the figures “1876” for the corresponding inscriptions on the territorial seal. The first General Assembly of the State of Colorado approved the adoption of the state seal on March 15, 1877. The Colorado Secretary of State alone is authorized to affix the Great Seal of Colorado to any document whatsoever. By statute, the seal of the State is two and one-half inches in diameter with the following devices inscribed thereon: At the top is the Eye of Providence or ‘All Seeing Eye’ within a triangle, from which golden rays radiate on two sides. Below the eye is a scroll, the Roman fasces, a bundle of birch or elm rods with a battle ax bound together by red thongs and bearing on a band of red, white and blue, the word, “Union and Constitution.” The bundle of rods bound together symbolizes strength which is lacking in the single rod. The axe symbolizes authority and leadership. Below the scroll is the heraldic shield bearing across the top on a red ground three snow-capped mountains with clouds above them. The lower half of the shield has two miner’s tools, the pick and sledge hammer, crossed on a golden ground. Below the shield in a semicircle is the motto, “Nil Sine Numine”, Latin words meaning “nothing without the Deity”, and at the bottom the figures 1876, the year Colorado came into statehood. The design for the Territorial Seal which served as a model for the State Seal or Great Seal of Colorado has been variously credited, but the individual primarily responsible was Lewis Ledyard Weld, the Territorial Secretary, appointed by President Abraham Lincoln in July 1861. There is also evidence that Territorial Governor William Gilpin also was at least partially responsible for the design. Both Weld and Gilpin were knowledgeable in the art and symbolism of heraldry. Elements of design from both the Weld and Gilpin family coat-of-arms are incorporated in the Territorial Seal. One of the US National Guard logo. Recognized around the world as a symbol of the United States and one of its great presidents, the awe-inspiring Lincoln Memorial attracts millions of visitors every year. In the main chamber of the memorial, some of these visitors lean against the back wall, crane their necks and contort their faces looking for a face in the rear of Lincoln's head. Some will attempt to decode Lincoln's hands. Looking for some deeper meaning, convinced that it must be here in this exalted chamber, most of these visitors will end up shaking their heads, shrugging, and walking away unconvinced of what they have seen. The irony is that the deeper meaning surrounds them, and has probably gone overlooked. While distracted by myths about faces in hair and letter-signing hands, many visitors miss the true meaning of the memorial and the ubiquitous symbol that carries that meaning. Instead of being hidden somewhere inaccessible, the symbol is deceptively obvious, right there under Abraham Lincoln's hands. So overlooked is this symbol that even when pointed out, many observers will assume the lines represent books. In fact, the symbol is that of fasces (FAS-eez), a bundle of rods bound by a leather thong. Repeated elsewhere in the memorial, the fasces throughout the Lincoln Memorial reveal the higher meaning of the memorial and the man. In ancient times, fasces were a Roman symbol of power and authority, a bundle of wooden rods and an axe bound together by leather thongs. Fasces represented that a man held imperium, or executive authority. Exercising imperium, a Roman leader could expect his orders to be obeyed, could dole out punishment, and could even execute those who disobeyed. The fasces he carried symbolized this power in two ways: the rods suggest punishment by beating, the axe suggests beheading. On its surface, the fasces imply power, strength, authority, and justice. Depicted throughout the Lincoln Memorial, the fasces mean all this and more. As one approaches the Lincoln Memorial from the plaza below, he or she passes by the first of these fasces at the base of the main stairs. The carving is easily missed even though it is more than ten feet tall, but to miss it is to miss the introduction to the theme of the memorial. There on the end of the wall is a carving of rods with an axe bound by a leather thong, the classic Roman fasces. The fasces indicate the power and authority of the state over the citizens, commanding respect. But there is a twist. A bald eagle's head sits atop the axe, an American touch on an ancient Roman symbol. Adding to the American-ness, there are thirteen rods shown in the fasces, suggesting the thirteen original states that achieved independence from Britain and formed the United States. Seen as symbols of the states, and the American motto "E Pluribus Unum," or "Out of Many, One," the rods bound together suggest the union of the states and their bond by the Constitution. Each state is weaker individually, but together, they are stronger. This concept is so important that it is presented long before visitors reach the building itself and see the representation of the Savior of the Union. The structure itself echoes and amplifies the idea of a strong union. By architect Henry Bacon's design, the perimeter of the Lincoln Memorial boasts 36 Doric columns representing the 36 states in the union Lincoln fought to preserve. The names and admission year of these states are engraved above the marble columns, the years not coincidentally shown in Roman numerals. The Lincoln Memorial is physically held up by the columns, standing strong because all the columns are working together. Without each column, the building would fall, just as the nation would fall without all its states. This concept of the memorial was incorporated into an object you may have in your pocket right now. Pennies minted between 1959 and 2008 depict the Lincoln Memorial on the reverse with the words "E Pluribus Unum" above the memorial. The implication is that the entire structure is a representation of the fasces, a representation of strength through unity, a monument not only to Lincoln but to the Union itself. Taken together with the fasces at the base of the stairs, the exterior structure of the Lincoln Memorial projects an aura of power, strength, and authority and compels respect and humility. Inside the chamber, however, the character changes considerably. White marble gives way to grayish limestone. Ionic columns replace Doric. Lincoln's majestic presence in the center of the chamber is larger than life. Engravings of Lincoln's Gettysburg Address and Second Inaugural Address are topped with gigantic murals that heighten the meaning of these influential speeches. Inside this chamber, visitors are treated to a glimpse of the internal wisdom behind all that external strength and power seen on the outside of the memorial. Inside the chamber, the fasces appear again and again, binding the memorial's features and artists together into one cohesive message. But inside the chamber, the fasces no longer show the axe. Without the axe, the fasces are a bundle of rods bound together. This image symbolizes the very idea of our nation: that many states bound together form one nation, and out of many people come one nation. Each wooden rod is breakable individually, but bound together they are strong. Each state is weaker individually, but bound together by the Constitution, they are stronger. As a symbol of the Union, the fasces have particular importance to Abraham Lincoln and his fight to preserve the Union. On the south wall, the Gettysburg Address reveals Lincoln's changing position on slavery as he euphemistically calls for "a new birth of freedom" as an outcome of the war. To illustrate that concept, Jules Guerin's mural above the engraving depicts the "Angel of Truth" emancipating the slaves adjacent to her. On the left of the mural, a figure holds a sword and a scroll to represent justice and the law; she sits in a throne with fasces on the front, implying the Roman connection between fasces and the dispensation of justice. However, these fasces appear without the axe, suggesting an emphasis on the concept of union symbolized by the bound rods, and less on the concept of punishment represented by the axe. On the opposite wall, Lincoln's Second Inaugural Address reviews the devastating conflict and Lincoln's desire to see an end to slavery, yet it famously closes with the idea of reunifying the nation "with malice toward none, with charity for all." Jules Guerin's mural depicts themes of reunion, charity, and fertility. Tucked in the margins of the address, axe-less fasces rise alongside the words, reinforcing Lincoln's theme of reunion, for the nation is stronger when all the states are bound together. The centerpiece of the memorial is Daniel Chester French's sculpture of Abraham Lincoln. Our eyes gravitate toward his, contemplating his mood and expression. We sense the tension and strain he is under, but also the command and presence he has. Because we are naturally drawn to the human component of the statue, we can easily overlook the flag draped behind him and the fasces beneath his hands symbolizing the Union he strained to preserve. To drive the point home, the inscription above the statue reads: "In this temple as in the hearts of the people for whom he saved the Union, the memory of Abraham Lincoln is enshrined forever." In the context of the time in which the memorial was built, Lincoln's status as the leader who "saved the Union" was paramount. The Lincoln Memorial's symbolic use of fasces, the unifying feature of the memorial, emphasizes the importance of the union of the states and Lincoln's role in preserving that union. It is not a symbol we commonly see today, or at least we do not commonly notice it, but the symbol is to be found throughout the capital city. 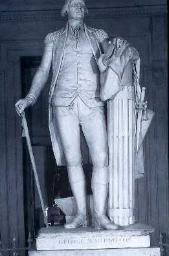 Fasces appear in the Oval Office, the House of Representatives, at the base of the Lady Freedom statue on the Capitol, on the U.S. Senate Seal, and in the copy of Jean-Antoine Houdon's sculpture of George Washington inside the Washington Monument. 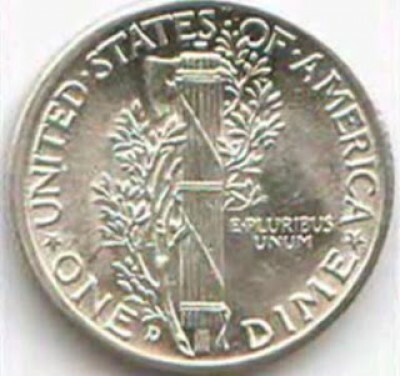 Fasces also appeared on the Mercury dime from 1916 to 1945, subtly transformed into the torch we see on today's dime in 1946, shortly after the close of World War II. "Fasces" is the root word for "fascism," a political ideology marked by nationalism, totalitarianism, and imperialism that exerted a dramatic force over global politics particularly in the 1930s and 1940s, most infamously in Germany's Nazi Party, which was modeled on the Italian fascist movement. Benito Mussolini's fascist government in Italy, the first modern fascist state, adopted the fasces as its symbol, harking back to the Romans. 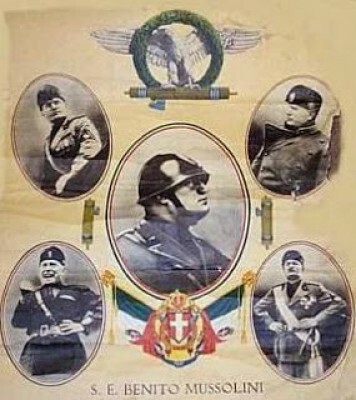 Unlike the American interpretation of the fasces as a symbol of strength through unity, the Italian fascists identified with the power and brutality also inherent in the fasces' meaning. Coincidentally, Mussolini's ascent came in 1922, just five months after the Lincoln Memorial was dedicated with the fasces as its overarching design element. Over time, tastes, styles, words, and symbols' meanings change as new generations project their own values onto old ideas. At the time it was conceived and built, fasces made perfect sense for the Lincoln Memorial. 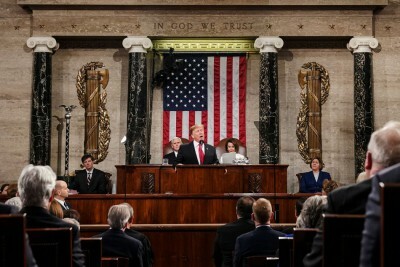 Fasces were a symbol of a long-lasting civilization on which our government was based, and a symbol of the very structure of our national identity, "E Pluribus Unum." In the aftermath of World War II, fasces might have been more taboo, a reminder of doctrines incongruous with American notions of equality and democracy. Today, probably for many reasons, many of us fail to recognize the symbol and its significance, both of which surround us in the Lincoln Memorial. If we lose sight of the symbol and its meaning, we lose the values the Lincoln Memorial was built to convey to us: the strength of our union, and the inestimable value of the man who fought to save it.